Reconstruction of a flag of the Kingdom of Benin based on a flag captured by British forces during the Benin campaign 1897; today seen in the British National Maritime Museum. The Benin Empire or Edo Empire (1440-1897) was a large pre-colonial African state of modern Nigeria. There is still an Obo, or king, although currently his role is mainly symbolic. The first Obo was Eweka I who died in 1246. The Benin Empire was one of the oldest and most highly developed states in the coastal part of West Africa until it was annexed by the British Empire in 1897. The European imperial power of Great Britain ended the Empire as a political polity in the late nineteenth century. The Obo opposed the colonialists and so they burned his capital. However, after the death of the exiled 35th Obo, who had stubbornly resisted them, they allowed the 36th to return to Nigeria. Along with other traditional leaders in the post-colonial nation state of Nigeria, the Obo of Benin is today recognized as a member of the House of Chiefs. He is the leader of the Edo community of some 5,000,000 people. Within his own community, the Obo is symbolic of a long cultural and historical legacy which remains famous for its artifacts of bronze, ivory, and iron. Sadly, when the British set fire to the Empire's capital, Benin City, in 1897, they also burned many valuable works of art. The colonialists were so sure of their moral right to rule others that they often did not notice, or did not hesitate to destroy, evidence that those whom they thought "primitive" had many skills and technologies of their own. According to one traditional account, the original people and founders of the Benin Empire, the Bini (or Edo people), were initially ruled by the Ogisos (Kings of the Sky). The city of Ibinu (later called Benin City) was founded in 1180 C.E. About 36 known Ogiso are accounted for as rulers of the empire. On the death of the last Ogiso, his son and heir apparent Ekaladerhan was banished from Benin as a result of one of the Queens changing the message from the oracle to the Ogiso. Ekaladerhan was a powerful warrior and well loved Prince. On leaving Benin he travelled to the west of the present day Nigeria to the land of the Yorubas. At that time the Yoruba oracle said that their King will come out of the forest and when Ekaladerhan arrived at Ife, he was received as a King. He changed his name to Imadoduwa meaning "I did not misplace my royalty" and became The Great Oduduwa of The Yoruba Land. On the death of his father, the last Ogiso, a group of Benin Chiefs led by Chief Oliha came to Ife, pleading with him to come back to Benin to ascend the throne. Oduduwa's reply was that a King cannot leave his Kingdom but he had seven sons and would ask one of them to go back to Benin to rule as the next King. Oranmiyan, the son of Ekaladerhan aka Oduduwa, agreed to go to Benin. He spent some years in Benin and came back to Ife after his wife gave birth to a son named Eweka. Eweka I became the first Oba of Benin. In 1440, Oba Ewuare (Ewuare the Great) came to power and turned the city-state into an empire. Around 1470, he named the new state Edo. The Oba had become the paramount power within the region. Oba Ewuare (reigned 1440 until 1473), the first Golden Age Oba, is credited with turning Benin City into a military fortress protected by moats and walls. It was from this bastion that he launched his military campaigns and began the expansion of the kingdom from the Edo-speaking heartlands. The lands of Idah, Owo, Akure all came under the central authority of the Edo Empire. At its maximum extent the empire is claimed by the Edos to have extended from Onitsha in the east, through the forested southwestern region of Nigeria and into the present-day nation of Ghana. The Ga peoples of Ghana trace their ancestry to the ancient Kingdom of Benin. The state developed an advanced artistic culture especially in its famous artifacts of bronze, iron and ivory. These include bronze wall plaques and life-sized bronze heads of the Obas of Benin. 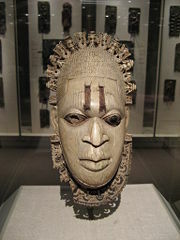 The most common artifact is based on Queen Idia, popularly called the FESTAC mask. Most artwork was commissioned by or created for the palace, often for ceremonial use. Much art depicted the Obo in various costumes. The guild of artisans enjoyed royal patronage and occupied a designated district of the capital. When Europeans first saw this art they supposed a non-African origin because they did not think Africans capable of such sophisticated work. The "Portuguese, the Ancient Egyptians, even the lost tribe of Israel" were credited instead of the Edo. The empire was ruled by a regent called the Oba. Today, the Oba of Benin is still very respected in Nigeria; he is the most revered traditional ruler in Nigeria though his powers are largely ceremonial and religious. The capital of the Benin Empire was Edo, now known as Benin City in what is now southwestern Nigeria. The Benin Empire derives its name from the Bini people who dominated the area. The ethnonym may possibly derive from groups in western Nigeria, where the term "ibinu" means "anger" reflecting the warring nature of the Binis or from central and north-central Nigeria, where the term birnin means "gated" or "walled area." The city and its people are more properly called the Edo. Today, this population is found mostly in and around modern day Benin City. It is from Portuguese explorers that we get the name the Benin Empire. However, the Bini name for the land and even the capital city was Edo. The first European travelers to reach Benin were Portuguese explorers in about 1485. A strong mercantile relationship developed, with the Portuguese trading tropical products, and increasingly slaves, for European goods and guns. In the early sixteenth century the Oba sent an ambassador to Lisbon, and the king of Portugal sent Christian missionaries to Benin. Some residents of Benin could still speak a pidgin Portuguese in the late nineteenth century. The first English expedition to Benin was in 1553. Visitors in the sixteenth and seventeenth centuries brought back to Europe tales of "the Great Benin," a fabulous city of noble buildings, ruled over by a powerful king. A significant trade soon grew up between England and Benin based on the export of ivory, palm oil, and pepper. Trade consisted of: 20 percent ivory, 30 percent slaves, and 50 percent other things. A sketch of the city from 1897, the year it was burned by the British. The city and empire of Benin declined after 1700, but revived in the nineteenth century with the development of the trade in palm oil, enslaved captives, and textiles. Benin grew increasingly rich during the sixteenth and seventeenth centuries on account of the slave trade with Europe; slaves from enemy states of the interior were sold, and carried to the Americas in Dutch and Portuguese ships. The Bight of Benin's shore soon came to be known as the "Slave Coast." Benin resisted signing a protectorate treaty with Great Britain through most of the 1880s and 1890s. However, after the slaying of eight British representatives in Benin territory, a 'Punitive Expedition' was launched in 1897, in which a British force, under the command of Admiral Sir Harry Rawson, conquered and burned the city, destroying much of the country’s treasured art and dispersing nearly all that remained. The portrait figures, busts, and groups created in iron, carved ivory, and especially in brass (conventionally called the "Benin Bronzes") made in Benin are now displayed in museums around the world. Some 3000 objects were removed and for many years stored in secret to perpetuate the myth that no such artwork could have an African provenance. The Oba was captured and eventually allowed to live in exile until his death in 1914. However, the office of Oba continued to be recognized in colonial Nigeria. Eweka II (1914-1933) built a new palace to replace the one that the British destroyed when they burned the city. Akenzua II (1933-1978) received Elizabeth II of the United Kingdom during her state visit to Nigeria in 1956. In 1966 he became Chancellor of Ahmadu Bello University, Nigeria. The Oba is advised by a Traditional Council. Both the Obo and the Nigerian Government (which has purchased back some items) have requested the return of what they describe as "stolen" art to Nigeria. ↑ West African flag. Retrieved January 27, 2017. ↑ Tribal African Art: Benin Style. zyama.com. Retrieved January 27, 2017. Ben-Amos, Paula. Art, Innovation, and Politics in Eighteenth-century Benin. Bloomington, IN: Indiana University Press, 1999. ISBN 9780253335036. Roese, P. M., and Dimitri M. Bondarenko. 2005. A Popular History of Benin: The Rise and Fall of a Mighty Forest Kingdom. Frankfurt, DE: Peter Lang. ISBN 9780820460796. Mercury, Karen. The Hinterlands, Historical Fiction about the Benin Expedition of 1897. Palm Beach, FL: Medallion Press, 2005. ISBN 9781932815115. Scholefield, Alan. 1975. The Dark Kingdoms: The Impact of White Civilization on Three Great African Monarchies. New York, NY: Morrow. ISBN 9780688029586. All links retrieved January 27, 2017. The Story of Africa: Ife and Benin BBC World Service. Story of cities #5: Benin City, the mighty medieval capital now lost without trace The Guardian. This page was last modified on 28 January 2017, at 00:05.